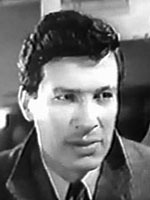 Micheal Tolan had only minor film parts in the 50s, He appeared in radio serials and on stage. 05/30/1974 0099 Dressed to Kill An unemployed actor plans a bizarre drama of enacting his own death and consequently impersonating his wife to claim the insurance money. 10/28/1975 0369 The Storm Breeder After being cursed to wander New England forever in search of their home, a lost soul and his daughter are doomed to bring rain in the wake of their passing. Moved by pity, a young judge works to bring peace to his restless spirit. 03/08/1976 0444 The Queen of Spades Intent on the pursuit of a secret gambling technique from a wealthy countess, he accidentally kills her. Now she's back to seek vengeance on the Russian soldier that caused her untimely demise. 03/31/1976 0459 The Spit and Image His luck takes a turn for the better when an ex-football player lands an unusual job-- to be the stand in for an eccentric billionaire. 10/31/1977 0732 Trial by Fire A clever deceiver manages to convince a tribal group that he is the appointed messiah from their deity of fire and dupes them into entrusting him with a fabulous jewelled crown. But trouble starts brewing when the fire god himself appears! 04/25/1978 0822 International Dateline This story revolves around a Machiavellian World War II fighter pilot who even cheats the good lieutenant who takes care of him after a severe injury lands him in coma. He romances her on work while maintaining a wife at home. Problems start when the two women meet and he begins to be chased by a malicious ghost. 11/08/1978 0915 Second Sight A psychiatrist recommends a grounded pilot to take up painting to help him loosen up. A strange series of events unfold when his paintings of death and destruction all come to pass the following day. 04/25/1979 0974 Letter of Love, Letter of Death A police detective puts his career on the line in order to prove the innocence of the rival of a murdered theatrical producer when he is accused of the crime. 06/29/1981 1214 Waking and Sleeping Despite having everything his heart desires, a man finds there is a void in his life and only the Black Feral Dog in the park can help him unravel the mystery. I loved Michael Tolan's voice! I recognized him from that voice when he would appear on television. He played Mary Tyler Moore's on again/off again boyfriend in The Mary Tyler Moore Show in the 1970s. Me too Lori. I think the synopsis of his career written above does not give him credit for a distinguished career in t.v. I recently watched a video on You Tube. He was doing a reading at his Alma Mater in 2009. In his early 80's at the time, he still had that wonderful voice and his good looks.